Discussion in 'Guitars in General' started by Frostbite Slim, Mar 3, 2012. Been waiting a long time for this project to finally wrap up. Just picked her up today...Fantastic!!!! Sweet! I have a Jenny body on the way, and have most of the parts together. 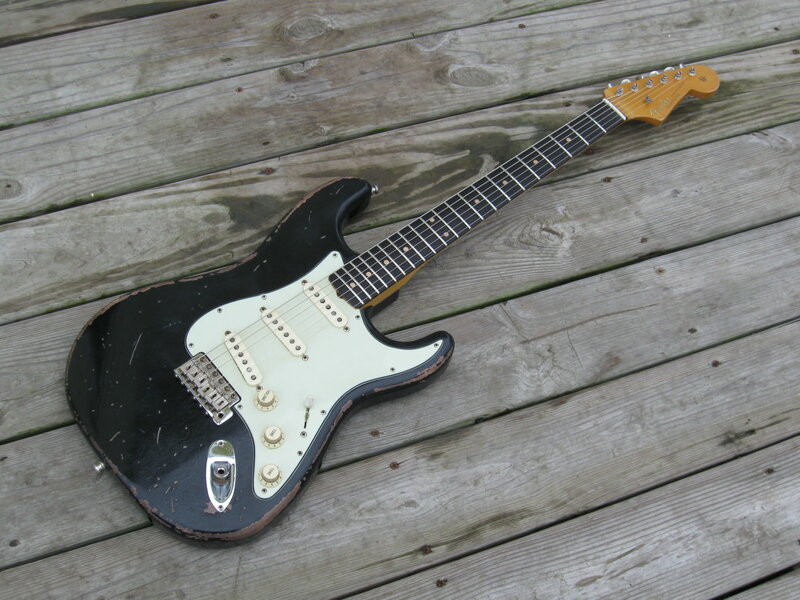 Very similair with black heavy relic and rosewood board. Was this a custom build from MJT? No, just the body was MJT. I had a Musikraft neck I sent Matt as well for finishing. My local Ace guitar tech Ron Pace ( Pace Guitar Repair) did a spectacular job of assembling everything. wow~ that is a stunner. Congratulations! Yes, plastics are from Fatboy Guitars and the pickups are Angeltones. These pickups are Kens' latest and greatest offering....the SRV/59 set. Other parts are callaham block, fender '62 bridge and aged Gotoh tuners (Thanks K-Line). Any idea if they do include F logos with their necks? or Decals? MJT DO NOT include logos or decals on the necks. I see. Where can I buy F decals ? Very nice! I was going to buy a MJT kit for this exact same guitar. Instead there was a white one for sale here that I just grabbed at a nice price so I figured I would go for it. Many I love the black with mint guard, but I guess white with mint guard will have to do. Nice man! I was never a fan of the color black for guitars, but it looks great with the relic-ing! I have a set of Ken's SRV/59 p'ups in my '61 Strat build. My favorite p'ups thus far. Dig on the bell like chime and huge bottom end response. Keep on with the get-down! 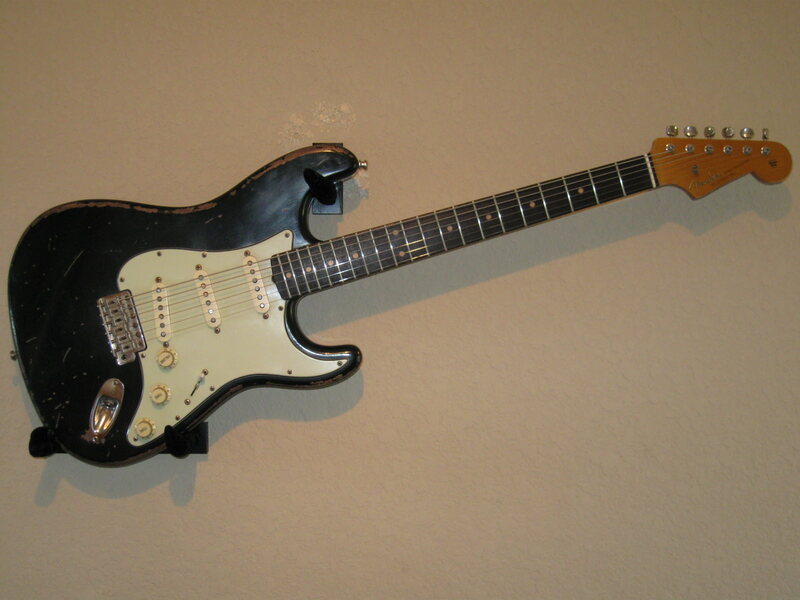 Try Fender? or eBay? or just try searching? 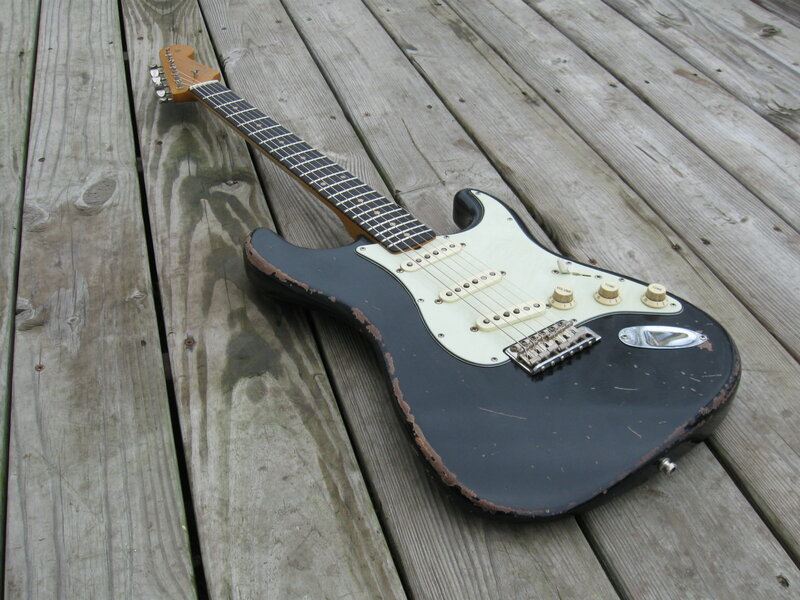 Great lookin' guitar. I've done alot of business with Mark over the yrs. Quality product and a super easy guy to deal with. Check the builders section here on TGP. So those Angeltone are nice? I may need to check in to a set of them. My favorite Angeltones to date! Ken is really cranking out some fantastic pickups as of late. The musikraft neck is their SRV/Aysemtrical profile and is super comfortable. This is by far the best sounding/feeling strat I own.